The centre ground in Welsh politics is not an attractive place to be, Plaid Cymru leader Leanne Wood has said. She told BBC Wales Newyddion9 she was surprised to be challenged by Adam Price and Rhun ap Iorwerth claiming they had no differences on policy. However, she said it was "quite possible" either of her rivals would be willing to make a deal with the Conservatives after the 2021 election. Plaid's leadership election result will be announced on 28 September. Ms Wood said: "The centre ground in Wales is held by Labour, and when people talk to me about becoming more centrist I just think of the Liberal Democrats and Tony Blair." "It is not an attractive place to be and it's a crowded field." Ask if she was surprised to face a leadership challenge from two of her AMs, Ms Wood said: "Most challenges are on the basis of politics and policy, aren't they? So yes, I suppose." The AM for Rhondda, leader since 2012, questioned which policies her rivals disagreed with. "I've never been told by anybody that any of the policies we have in the party are problematic," she said. "So I would challenge anyone to say what I've done policy-wise to take the party in a particular political direction. "As far as I'm aware there is no discontent with our programme that was actually put together by Adam Price ahead of the 2016 election." Ms Wood said it was "quite possible" that Mr Price and Mr ap Iorwerth would be willing to strike a deal with the Conservatives after the 2021 election to take power, but would not do so herself. 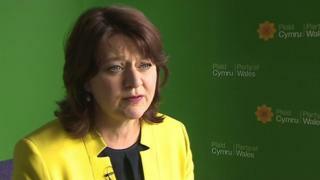 "If there are other people in other positions who are happy to vote for Plaid Cymru's First Minister candidate as they did before - or if they are happy to vote for our programme of government or our budget - then I'm more than happy to take those votes," she said. But Ms Wood added: "Those votes would be taken on Plaid Cymru's terms and not by doing deals - especially with the Tories." Following the 2016 assembly election, there was deadlock in the vote for first minister as the Conservatives and UKIP joined Plaid Cymru in backing Ms Wood. A fresh vote a week later saw Carwyn Jones reappointed unopposed as Labour and Plaid agreed the so-called "compact" deal on policy priorities and consultation.